Is the Gender Agenda Gaining Momentum? Every year around the world, International Women’s Day (IWD) is celebrated on March 8. Thousands of events are organised at international, national and grassroots levels to celebrate the economic, political and social achievements of women. Each year comes with a unique theme that reflects on women and relevant to global and local gender issues. Like many women, Agnes looked forward to celebrate 2013 international women day on march 8, little did she know that it would be her last celebrations. Her husband cut her life short as soon as she returned from the celebrations.This years’ theme was the gender agenda gaining momentum. Reading Agne’s story, one wonders whether the gender agenda gaining momentum? or it is loosing it after over 100years of celebrating this day. Readers, what is your reflection on this? Hellen is a simple, calm and soft-spoken woman with a big heart for helping women and children. She has done what is in her reach to support them and make their lives better and more meaningful. 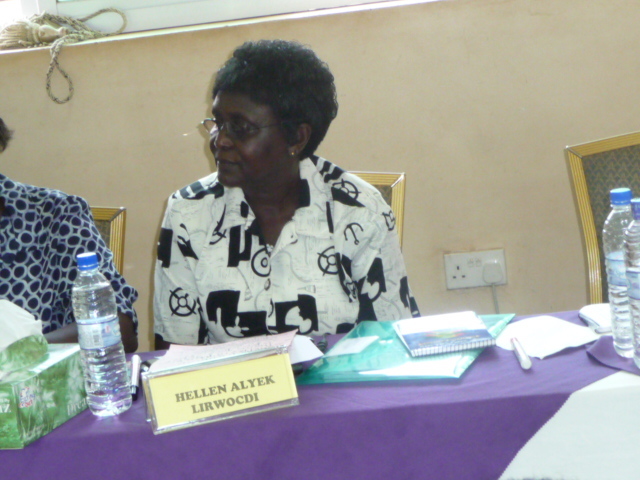 I met Helen Alyek during a meeting for Women Taskforce Members for a gender responsive Peace Recovery and Development Plan (PRDP) for North and North Eastern Uganda in Kampala in April, 2012 organised by Isis-WICCE. Hellen is from Lira district and she is a retired Superintendent of Uganda Police Force where she served for over 25years and established the Child and Family Protection Unit. Hellen is also the founder and the Director of Lira Rural Women and Children Development Initiative Shelter (LIRWOCDI). During her career in the Ugandan Police Force Hellen worked in various sections such as Traffic, Police 99 Patrol, Interpol Narcotics Drugs, Criminal Investigations, Juvenile Court (as a court prosecutor), and later as an Administrator at the Police Headquarter in Kampala. As a court prosecutor in the Juvenile courts, Hellen used to receive many complaints from young offenders between the ages of 12-14 years that they were mistreated and harassed by the adult suspects in the cells. In order to offer protection to the children suspects, Hellen risked herself and kept the children in her house in the police barracks, feed them and bought clothes for them. Unfortunately, the young criminals did not spare her, they would steal her property and run away and she never gave up. It was the frustrations from the young offenders that Hellen an hatched the idea of establishing special units for children at police stations where they can be protected. She shared the idea with the then Inspector General of Police and the then Chief Advisor for Police from Scotland Yard who also supported her idea. The Unit also raised community awareness about the rights of women and children, and taught crime prevention tips to children in nearby schools. With time the CFPU became so popular so the need for expansion. Hellen approached UNICEF for support to the unit and she got funding for training of the first 120 police women and men. These officers were trained in human rights, counseling, investigation, the protection of women and children, as well as interview techniques for young survivors and suspects. After the training, they were posted to police stations all over Uganda to handle cases of violence against women/children and were made aware of the importance of separating young offenders from the adult suspects while in custody. UNICEF further supported the unit with a motor vehicle to oversee the work of police officers within the CFPU countrywide, 20 bicycles and 120 motorcycles for officers to use in the field. With the support of UNICEF and other donors, separate rooms for young offenders within five police stations were constructed in Masaka Police Station in Southern Uganda, Gulu in Northern Uganda, Kumi in Eastern Uganda and the Central Police Station in Central Kampala, which were registering the highest crime rates committed by children. As a result of this initiative in the Uganda Police, Hellen received the International Scholarship Award in 1997 by the International Association of Women Police (IAWP) in Dallas, Texas as the first Woman Police Officer in Africa to be recognized. In that same year she was also awarded a Certificate of Recognition by the Inspector General of the Uganda Police Force as Police Woman of the Year. When Hellen was doing her supervisory role in the police force, she visited several IDP camps in Northen Uganda where she met over 50 female survivors of sexual abuse who shared with her their moving, sad stories. The stories touched her heart and inspired her to find a solution. Hellen also saw many orphans in the camps who had lost their parents due to armed conflict or HIV and AIDS and they had nowhere to call home. Due to sexual abuse and exploitation of female orphans, aged 12–15 years, many became young mothers and she felt that the best way to protect these women and children was to build a shelter where survivors of abuse could take refugee and nurse their injuries. “By the time I retired from the Uganda Police Force in 2003, I had already established a shelter and registered it with the Lira Non Governmental Organization (NGO) Board and the Local Lira Government. I also contacted the International Association of Women Police for support to construct a permanent building for the Shelter with a perimeter wall. In the same year, the shelter received fifty female survivors of abuse. 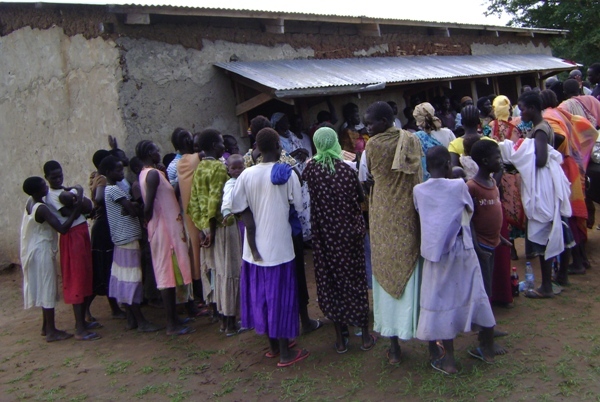 This is the first ever shelter of its kind in Lira District – Northern Uganda. Hellen recalls. Since 2003 more than four thousand women and child survivors of abuse have passed through this Shelter. With support of UN Women and Children’s Fund the shelter also has been able to repair 40 serious cases of Fistula and the youngest survivor was four years who was raped by a neighbor. The shelter also provided medical treatment to over 60 young mothers who were sexually abused. As part of raising awareness on Sexual and Gender Based Violence in the community and the duty bearers, Hellen spear headed the first ever Town Hall meeting in Lira town where district officials and community members discussed issues of SGBV. The main objective of the meeting was to make the district officials aware of injustice women survivors of abuse face when they are not able to pay the Police Surgeon’s fee and to devise means of protecting women and children from violence and abuse. Despite the achievements, the shelter still faces some challenges as it mainly run on donations from well wishers. According to Hellen, the most pressing needs of the shelter are school fees for orphans to go to school, feeding and clothing, medical care, skills training for young mothers, and a vehicle to ease the movement among others. When the law fails to deliver justice for Women and Children. The month of March is internationally known as the women’s month, a month that is supposed to be a time for reflection and celebrating what has been achieved in advancing women’s rights worldwide. 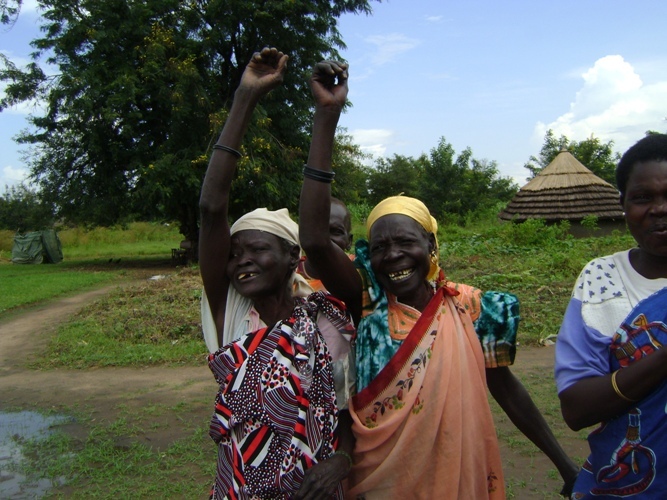 To the surprise of the women in Uganda, March 2012 has been a month of mourning. 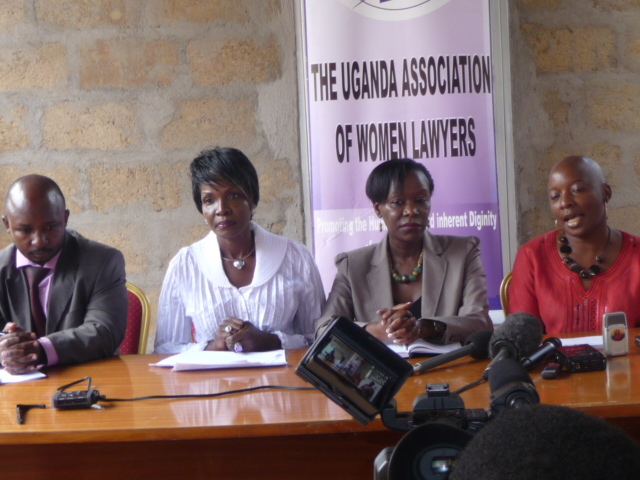 Women of Uganda have seen the betrayal of the state that is supposed to protect their rights. Two cases have been in the spotlight. In 1997, Sharma Kooky, a Uganda of Indian decent tortured and brutally killed his wife by electrocuting her. After the murder Kooky hasted to cremate the body to hide evidence but was stopped by authorities. Women activists also rose up in arms and ensured that justice was done at the time – in 2000. The High Court convicted Kooky of the murder and was sentenced to death. Twelve years down the road, the Uganda Women Movement is shocked at Kooky receiving Presidential pardon on humanitarian grounds and he is now a free man. According to the Constitution of Uganda under article 121 through the advisory committee on the prerogative of mercy, the president is mandated to exercise his rights to release prisoners. Unfortunately the decision of the State cannot be questioned! 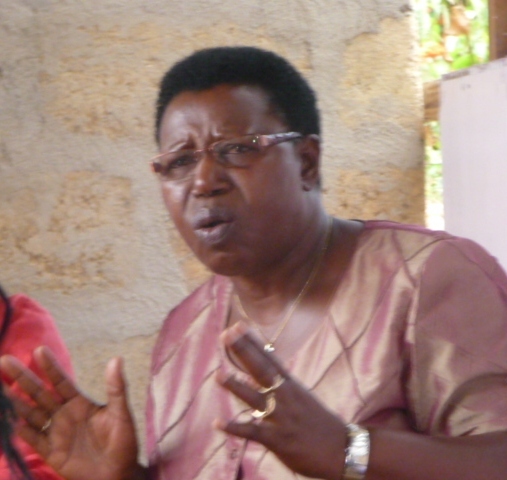 Miria Matembe, former minister of Ethic and Integrity and renounced women rights activist said that the women of Uganda were pained by the marginalization of the justice system. She recalled the efforts of the women activists in 1997 that led to the sentencing of Kooky and how all that has been trashed by the president. But the women movement were vocal on Baro’s sentence as they were on Kooky’s presidential pardon. They also expressed fear that such acts would escalate violence against women and children in the country. “If the state can’t protect the vulnerable and marginalized groups, who will do that. This is a clear manifestation of failure of the state to protect women and children from sexual and gender based violence,” said one of the women activists during the press conference. The women expressed their disappointment with the magistrate for the linient sentence given to Emmin Baro and are embarrassed that it was done by a female magistrate. The magistrate did not act as a human being, she acted like a machine. Matembe noted. The Chief Magistrate at Nakawa court has now referred the case to the high Court after protests. The defilement Act of Uganda clearly states that any sexual activity with children amounts to defilement, which is a capital offence and is punishable by death. These two scenarios are a slap in the face of justice. The women are also questioning the government commitment to prevent and stop sexual and gender based violence. In December 2011, during the International Conference on Great lakes region, the government signed a declaration to fully domesticate and implement the protocol on prevention and suppression of sexual violence against women and children in the Great lakes region. The women are now calling for though investigation and prosecution of Emmin Baro for each child abused. They are also calling for psychosocial and trauma counseling for the abused children, operationalisation of the domestic violence acts of 2010, enactment of sexual offences bill. They are also demanding for transparency of the presidential pardon of Kooky and investigation of the entire justice and law system. The women’s movement is also considering the avenues of seeking audience with the respective judicial officers including the chief justice to ensure that justice is delivered. Meanwhile, a day of mourning for Josh Renu who was murdered by her husband Kooky with impunity will be communicated. The recent press reports of ethnic clashes in South Sudan over cattle and other resources indicate that South Sudan is still far away from attaining peace and stability after gaining its independence in July 2011. The situation remains worse especially for women and children because they are the most affected. According to IPS Gender Wire, an online news agency thousands of women and children are being abducted and over 1,000 people have died this year. The conflict is being attributed to the easy availability of arms and cultural norms that portray the ownership of cattle and women as a sign of success. Last year I was in Juba for the training of health workers and these reports confirms the discussions we had during the training. The health workers from Central Equatorial State informed us that in some cultures, young girls are booked for marriage and the man who pays the highest number of cows takes the girl. In otherwords, marriage process is like a marketplace where girls are auctioned and the highest bidder takes her. As a women’s rights activist, I find this very disturbing. How long will this go on? When will the men realize that God created man and woman to support and complement each other. 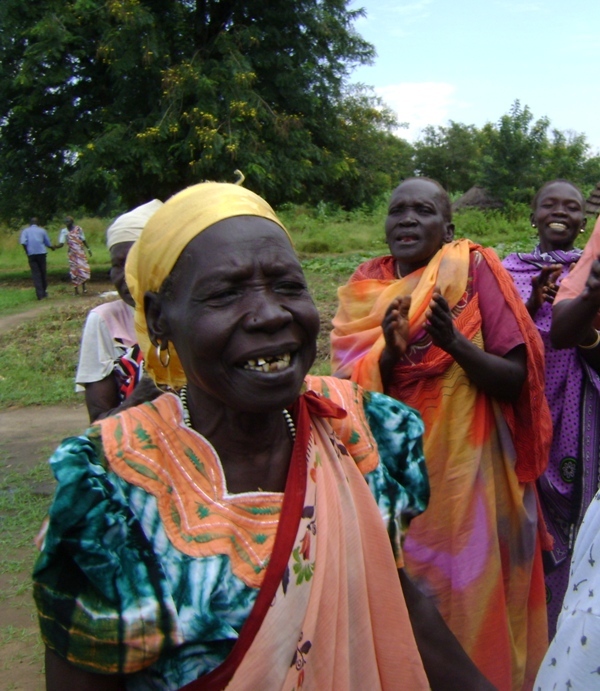 While some countries seem to have made some strides in towards achieving gender equality and other MDGs, the story is different in post conflict South Sudan. 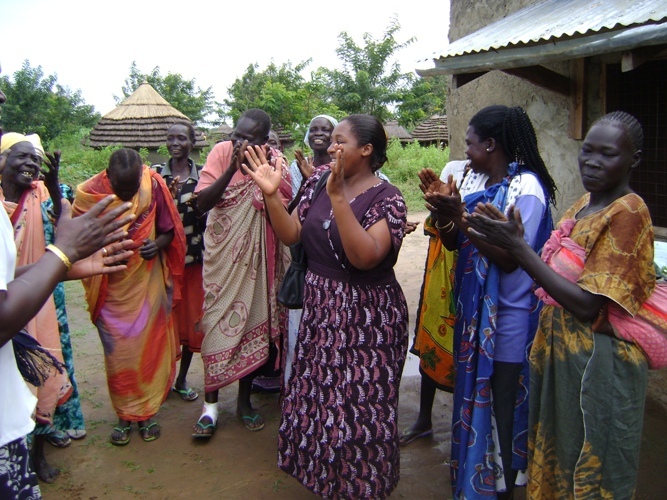 As a result of instability, the women of Southern Sudan missed out on all the developments and benefits of and within the women’s movement world wide. Women are still regarded as men properties and that is why men have to go out of their way to acquire such property and hence cattle rustling and the ethnic clashes. The situation is worsened by the cultural and traditional beliefs and practices in South Sudan which put men in a superior position and regard women as inferiors. Therefore with the ushering in of new state, the women of South Sudan require a lot of support from both the Government of South Sudan and the entire world women’s movement to enable them catch up on what they missed and demand for their rights and dignity as human being. As part of the campaign to combat violence against women using ICTs, Isis-WICCE conducted a training on VAW and ICT for grassroots women activists in November 2010. The purpose of the training was to equip women leaders with ICT skills to enable them create platforms and opportunities for women to engage with ICT to address violence against women and girls. The training emphasized the use of new tools of communication for communication, the intersection between ICTs and VAW, use of mobile telephone applications for advocacy, Computer and Microsoft Word skills, Internet and web2.0 applications(blogging) and citizen Journalism. During the training, a 59 year old participant shared with us an experience of how women in the olden days creatively used local platforms to combat violence against women. She shared that when she was growing up as a young girl, women used to look for a strategic location in the village which was usually an anthill. The woman would stand on top of the anthill and start shouting about the bad behaviors the husband has and she would say “my husband is bad, she beats me when I give meat to the children, he is a glutton, he doesn’t want me to do this that and that….” So that everyone in the village hears about her husband’s bad behaviors which would prompt the villagers to gossip about him, musicians would compose songs about his bad behaviors and he would be ashamed and eventually change his behaviors. Today, technology has provided us with much more advanced platforms compared to an anthill such as mobile telephones, internet, computers where we can make noise about VAW so that the whole world can hear us. Unfortunately, most women lack the technical know-how and resources to access such tools and fully utilize, engage and participate. for me I have always seen a computer. There is an NGO that gave our group a very big computer but we have never touched it because we feared it. The computer is ours but we have never touched it. Now that I have got the knowledge and the skills, when I go back, I will use it” said Lyaka Grace from LASO. And Kintu Solome said “I used to think that computers are only for those people who are educated and are in big offices in Kampala but today I have realized that I can also use a computer”. men buy mobile phones for the wives to control them. If a man calls the wife and she does not answer the call immediately, she will be asked to explain what she was doing and she will be beaten. Remember, at times the wife might be in the garden or in the kitchen cooking”. For Gladys Maloba, her experiences was that mobile phones have increased the rate of telling lies especially among the couples.Forinstance, you call your husband ask him where he is, he will tell you that I am Bugiri on the contrally,when get to Namayingo, you find him there and he asks you where are you going? who has given you permission and you will be beaten. And for Barbara, her learning was that “much as these telephones have caused violence against women in some circumstances, I have learnt that we can use the same phones to send messages to the men who violate women’s rights to educate them about VAW”. 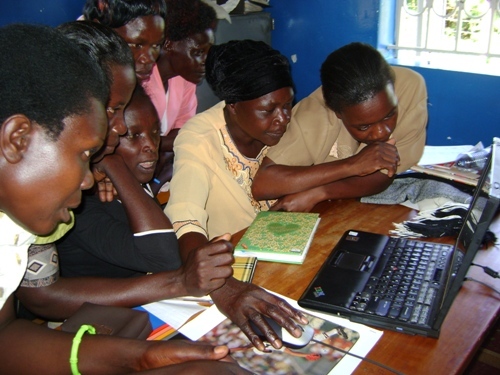 The women for the first time were able to see and use internet by searching the web and opening up their first email addresses, a group email(tumbulawomen@yahoo.com) and a group blog(http://www.tumbulawomen.wordpress.com/). To most of them, they imagined that internet was a building in Kampala while others thought internet is a human being. This is a reflection of total ignorance or lack of any knowledge of such tools. While some us have access to such communication tools and are using internet, email on a daily basis, many women in rural areas have not even heard about such tools. Lastly, the women were introduced to Frontline SMS software application used for sending bulk SMS. This software works with any Global System for Mobile (GSM) network. They used it to send out test message to them selves. During the 16 Days of Activism against Gender Based Violence, the women used this platform to send out text messages to raise awareness on issues of violence against women and women’s rights in their community.